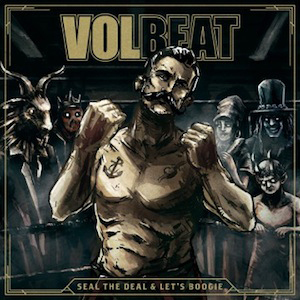 VOLBEAT will release their brand new full length offering, Seal The Deal & Let’s Boogie, on June 3 via Republic Records. The album boasts 13 new tracks of the band’s unmistakable sound, produced by Jacob Hansen as well as frontman Michael Poulsen and guitarist Rob Caggiano. The opening track “The Devil’s Bleeding Crown”, is now streaming by way of a lyric video and you can check it out below. Poulsen exclaims, “After months writing and recording, we’re thrilled to finally be able to unleash Seal The Deal & Let’s Boogie into the world. Play it loud!” The album marks the second to feature former ANTHRAX guitarist Rob Caggiano, who joined the group back in 2013. "The Devil’s Bleeding Crown" kicks off the album with a hefty guitar lick rounded out by a thick yet discernible guitar tone backed by a swinging drum beat. Poulsen’s heavy metal Elvis voice once again rings in the familiarity as VOLBEAT are on their way to another classic track. The ever-present gallop gives a feel of immediacy hinging on slightly above mid-tempo that sees the track ready to free itself from any restraints. In anticipation of the album, the band has created a special one-night-only “Evening with VOLBEAT” headline show at the Roxy in West Hollywood, California on April 13. It will be a once-in-a-lifetime chance to see the band in an intimate setting. The band will then play their debut Coachella show (April 15 and April 22) and hit the road for a short West Coast run with BLACK STONE CHERRY and MONSTER TRUCK. More tour plans will be announced soon. VOLBEAT has also announced that longtime friend Kaspar Boye Larsen will be handling the bass duties for these upcoming U.S. shows. Larsen has stepped in before on bass, helping out during their first European tour in 2006.